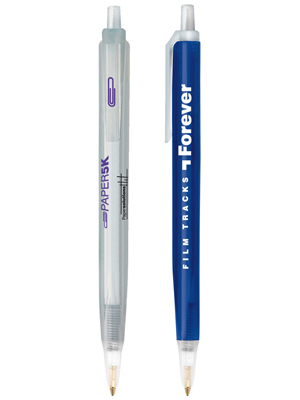 All pens include clear trim. Imprint Area: 3" x 1/4"
Price includes a 1-color barrel imprint on 3 sides. One line of copy per side. Copy and color may be different on each side at no additional charge. Packaging: Standard - 10 lbs. (approx.) @ 500 per carton. Special packaging (click here).